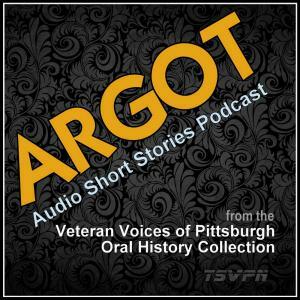 On this episode of Argot: Audio Short Stories from the Veteran Voices of Pittsburgh Oral History Collection, WWII veteran Robert Rose of Rochester, Pennsylvania shares a story about the cold during the Battle of the Bulge. During WWII, Robert J. Rose of New Brighton, Pa served as a cannoneer with Battery “A” of the 574th AAA Auto Weapons Battalion, 13th Armored Division. Patton’s Army. After landing in France, he and his unit moved across Europe towards a particularly stubborn German entrenchment known as The Bulge. Mr. Rose’s job was to take out enemy aircraft by engaging the swooping threats from his M16 Halftrack–those peculiar looking war vehicles, much like the front of a commercial cargo truck welded to a tank. Atop the halftrack are swiveling machine guns–exposed and without much armor–but capable of striking the enemy at 7,000 yards. And there sat Robert Rose on April 12, 1945, feeding four, red-hot .50 caliber machine guns during an ambush at Urbach in the Ruhr Valley of Southern Germany. ACK ACK ACK ACK! ACK ACK ACK! ACK ACK ACK! The guns roared, sweeping the surroundings, striking at everything and anything flashing around them. And then a hot piece of well-aimed German steel knocked Robert to the ground. “I’m shot,” he cried out before settling in and losing consciousness in the freezing snow and cold. The original interview was recorded in December 8, 2012 by The Veteran Voices of Pittsburgh Oral History Initiative. This audio short was engineered and produced by Kevin Farkas.